You are here: Home / Home / Law Guide / Car Accidents / Truck Accidents – How are They Different From Car Accidents? Semi-trucks are enormous. They are critical to the survival of many businesses in the United States, but when they cause accidents, it can get scary. There are many factors that make trucks more likely to get into an automobile accident than regular passenger cars. One example of these factors is the difference in the time it takes for the vehicle to stop. A standard car traveling 65 mph can come to a complete stop in approximately 162 feet. A semi-truck, on the other hand, would take an average of 420 feet to stop at that same speed. Most drivers don’t account for that vast difference and most do not realize the danger they put themselves in by pulling out in front of speeding trucks. You would think that if the truck did not have a trailer attached, it could stop a lot faster. In reality, the opposite is true, the braking system on semi-trucks is actually designed to work better with more traction; so when there is no trailer, some trucks can be even more difficult to stop. 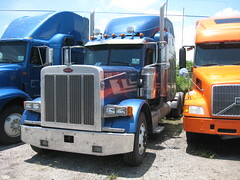 Another sharp contrast between semi-trucks and standard automobiles is the visibility factor. Trucks can be so large that the driver will have limited visibility in several spots. These visibility problems create hazards out on the road. Because large trucks are difficult to operate, and small mistakes can create great danger, truck accidents happen quite frequently. These accidents result in severe injuries more often than standard automobile accidents because the force with which these trucks move is so vast. One positive about trucks is that they are typically being driven for a company. That company will almost surely have insurance, and that insurance is typically set up to be able to manage the potential large risks associated with a large truck. In other words, the stakes are higher. If you or someone you know has gotten into an accident with a semi-truck, it is important that you seek legal representation. An experienced personal injury attorney will understand your accident and will be able to show the negligence required to get the at-fault party to pay for your claim. Settlements after these types of accidents have the potential to be worked out quickly when an attorney gets involved because the liability carrier’s insured party: the company, will be eager to handle claims against it so as to avoid bad publicity regarding the danger of their transport system. An auto-accident attorney who has experience working with truck accidents in particular may be especially helpful in resolving your injury claim.